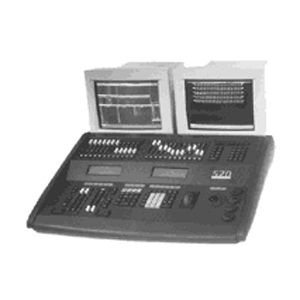 Strand 520/550 memory lighting console with 54 submasters, for use with GeniusPlus or Lightpalette operating software and additional optional Strand application software packages. The operating software chosen set the capacity of the system in increments from 100 intensity channels plus 100 colour or motion attributes to a maximum of 1500 channels plus 500 attributes. Attribute capacity could be increased by re-allocating unused intensity channels. Future expansion of capacity or functions (through application software) was designed into the system through the purchase of upgrade packs or additional extension software.